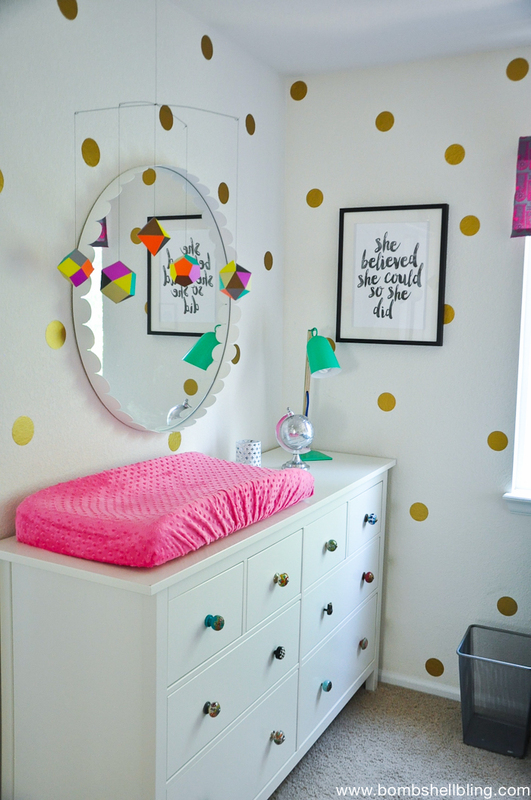 I am so excited to show you my friend Liz’s colorful, modern nursery today. IT IS FREAKING AMAZING!!!! When I walked into it I gasped. Literally. And then I gushed like it was my job. Every last detail is perfection. She has flawless taste! I’ll be quiet now, because the pictures really speak for themselves. GORGEOUS, right?!?!?!?! Here are some sources for the fabulousness. 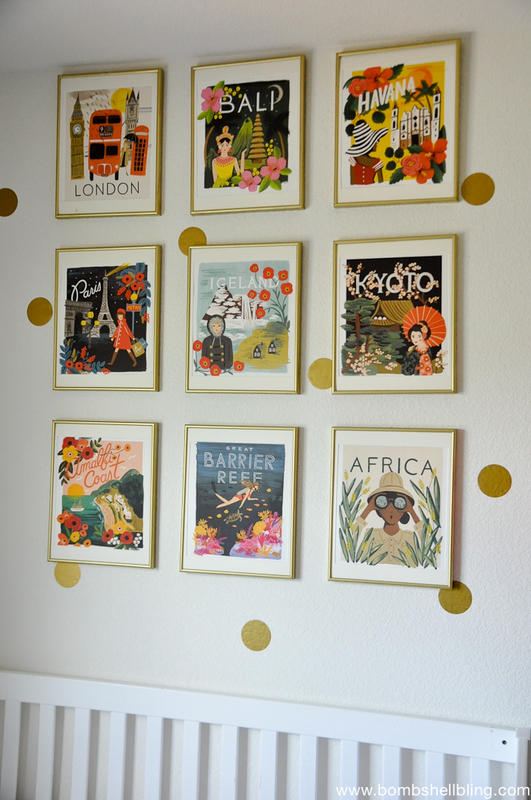 The wall art is actually a calendar from Rifle Paper Co that she cut apart and framed. (CLEVER, right? TOTALLY makes the room!) 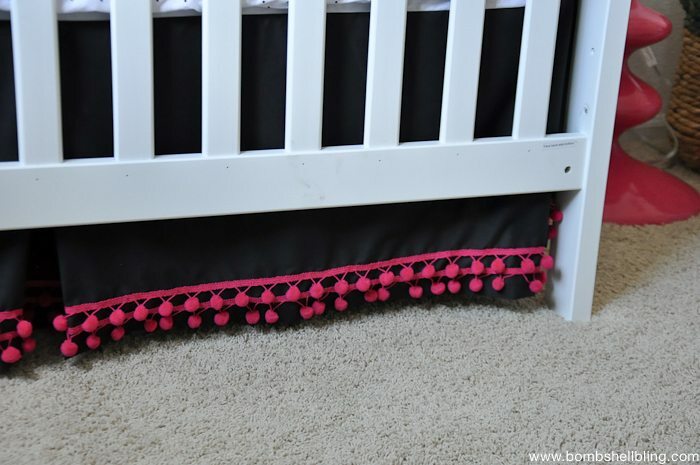 The crib skirt is a Land of Nod knockoff that my friend Jessica and I teamed up on. Crib bedding made by Jessica. 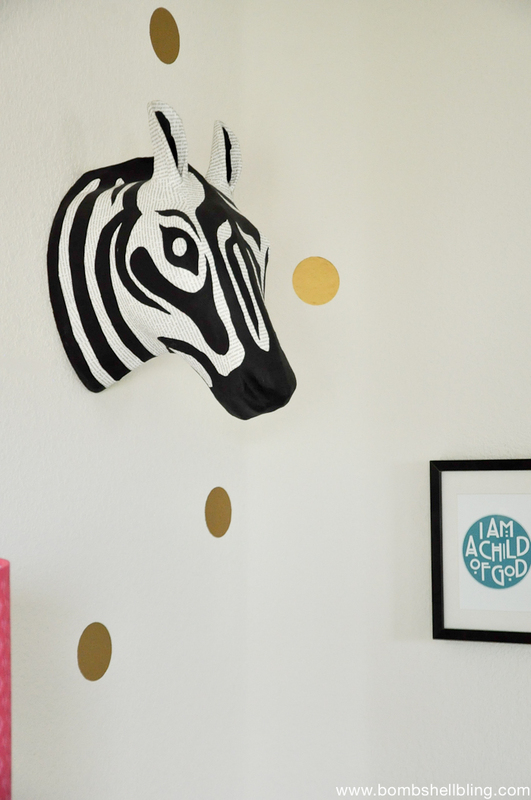 Zebra head is from Anthropologie. (I am so obsessed with that zebra head!) 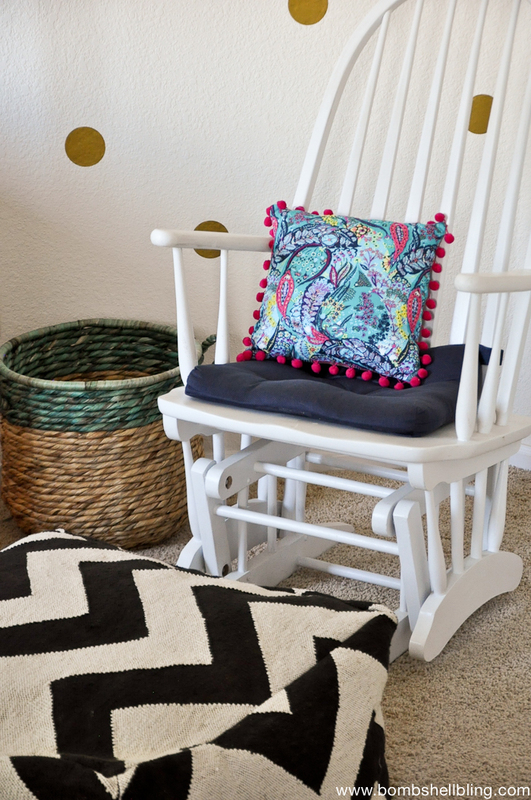 The chevron pouf is from West Elm. 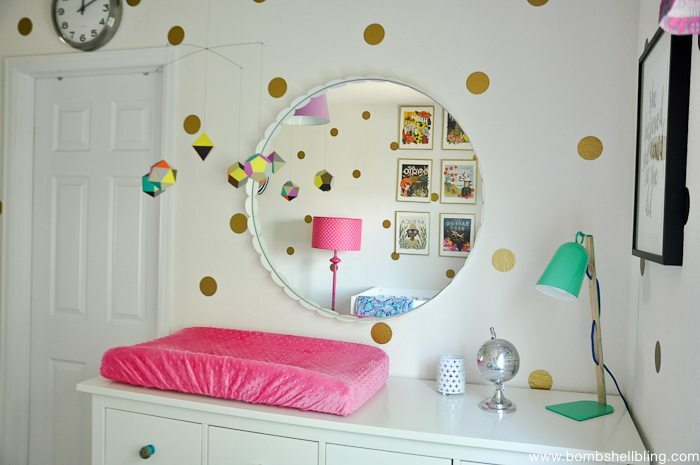 Lamp and ceiling fixture are from Land of Nod. Blue bookshelf is from IKEA. Bulldog bookends are from Target. 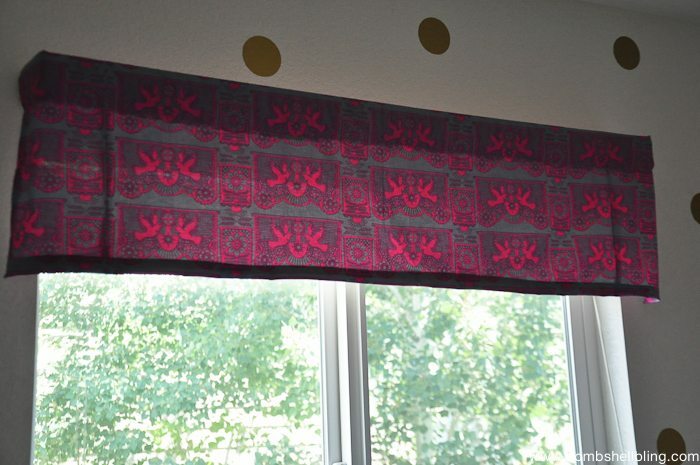 Curtain made by yours truly. 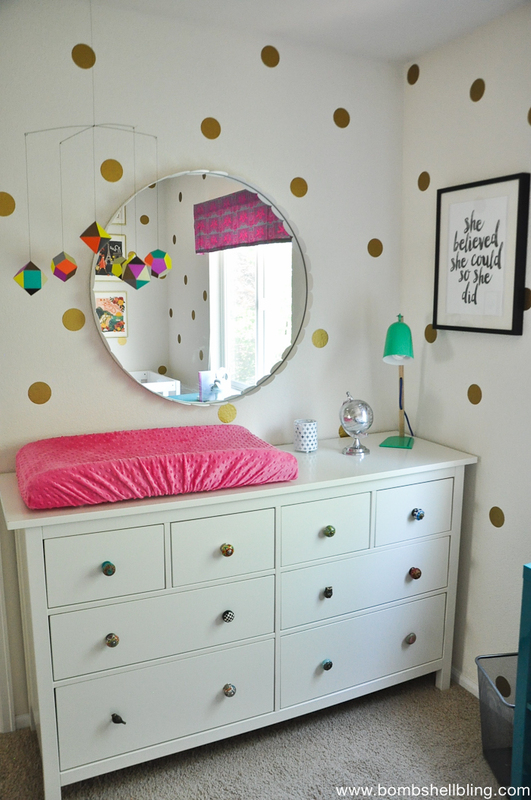 Dresser from IKEA, knobs from World Market. Mirror from Crate & Barrel. 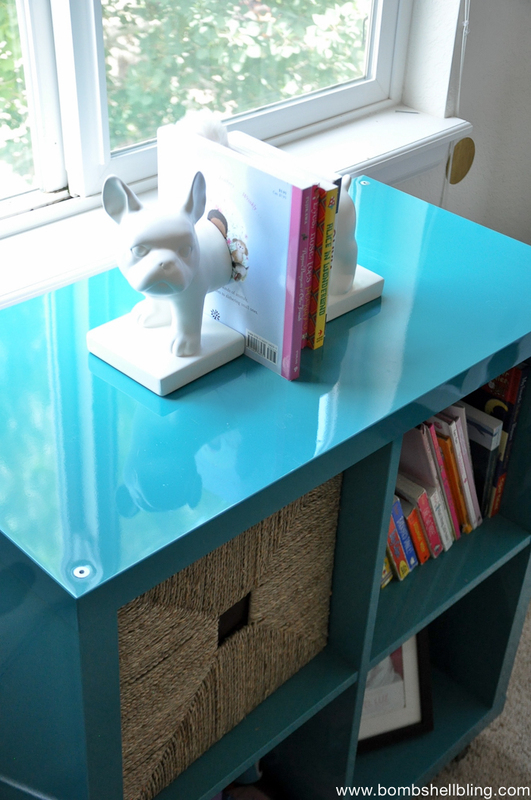 Lamp from Land of Nod. 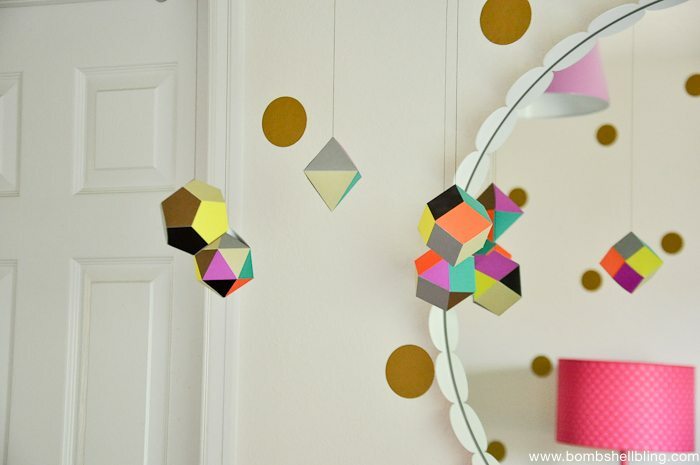 Mobile from Dwell Studio. SOOOOOOO amazing, right?!?! Luckiest little girl in the world!!!! 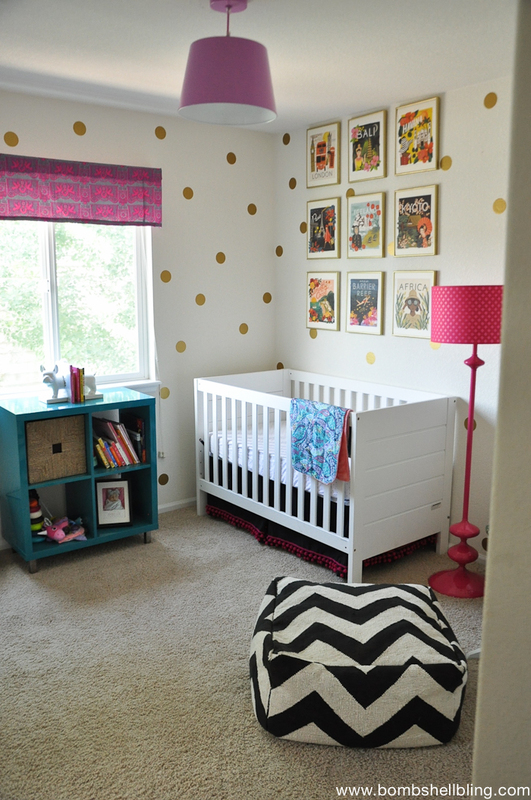 Which part of this nursery is your favorite? 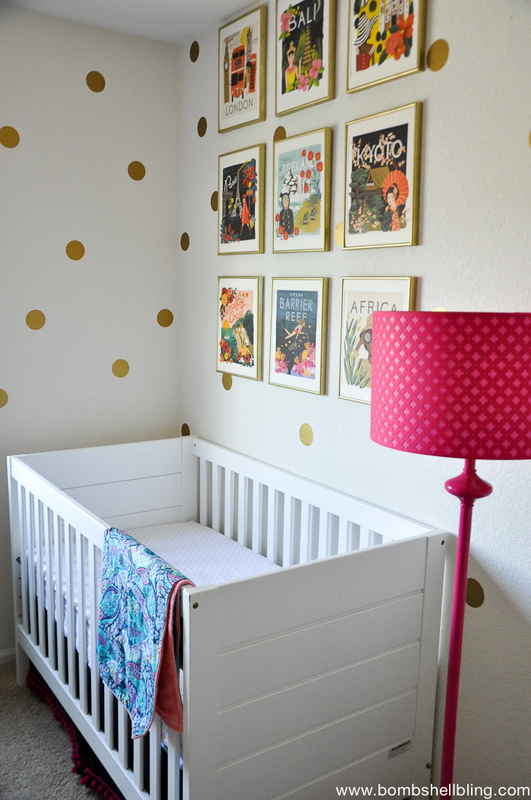 If you love this nursery then you should check out my nephew’s nursery and my daughter’s nursery! 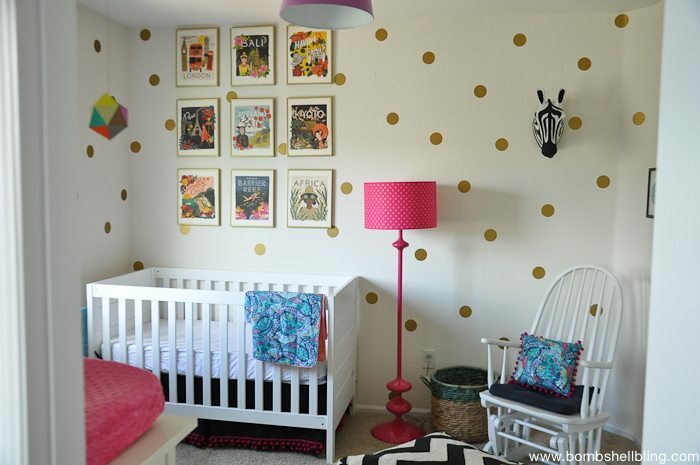 I love everything about this nursery! I love the modern, chic vibe. But if I had to pick I think the mobile is my favorite. So cute!!! Wow! This nursery is so fun!! Look at all of those details! Love, love, LOVE! I really love how bright everything is! LOVE IT! That’s seriously gorgeous. This is the cutest thing I’ve ever seen. Wow. What a lucky baby girl! I am OBSESSED!!!!!!!! I need it all. I love love love the mobile. 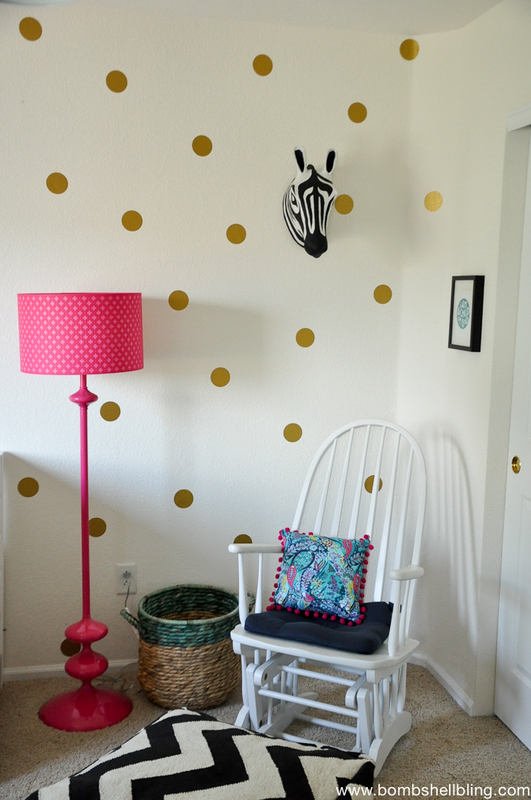 And the polka dots on the wall. I knew you’d freak!! The dots are vinyl! Love it all…. especially that amazing wall art!! So unique and fun! Gorgeous! 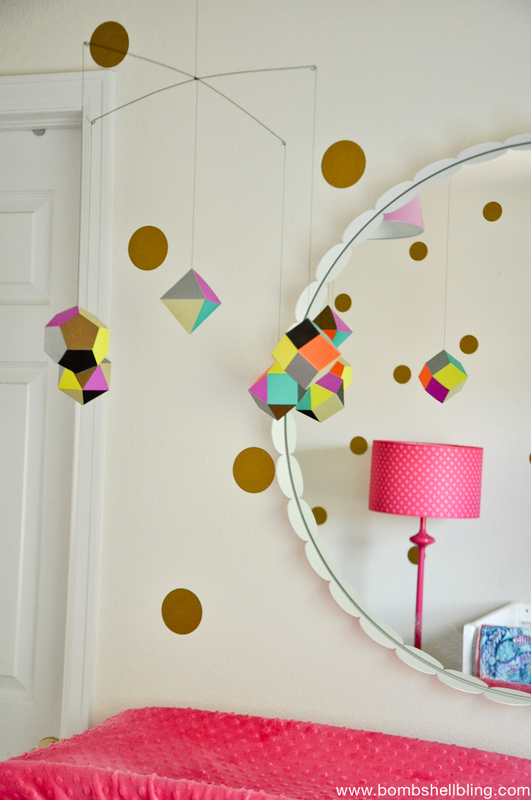 I know its a nursery, but I would love this to be MY room! I love it. 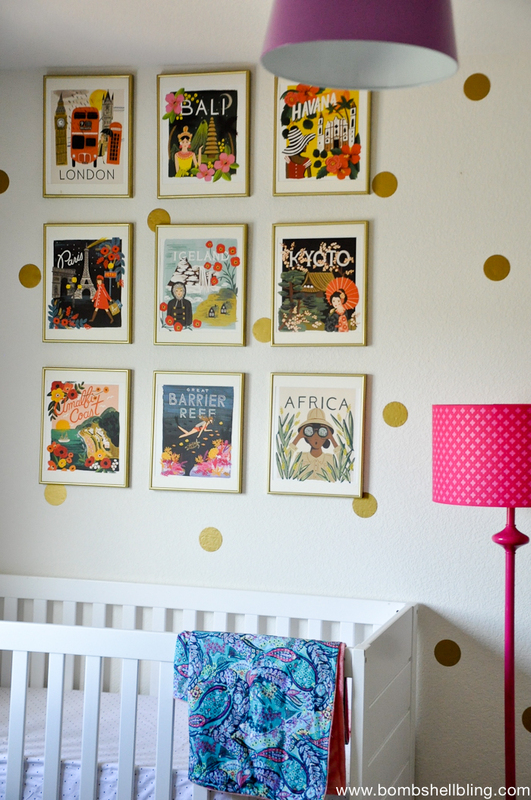 I love the prints on the wall and I love the gold dots. I love all the different knobs on the dresser. Did you make those? I also love the mobiles! It just swoon-worthy! I know, right?! 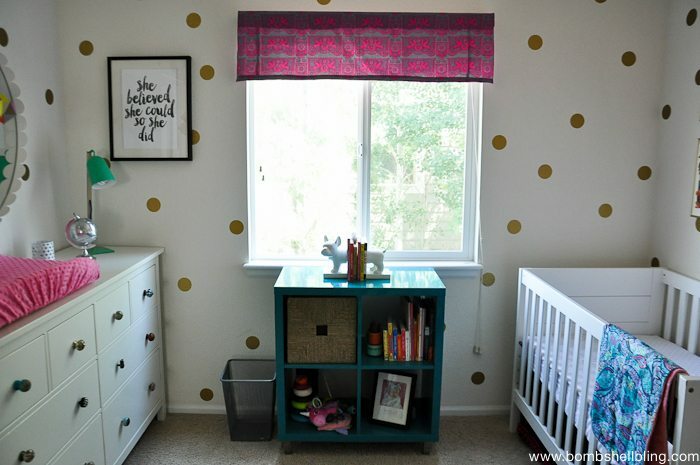 She did a great job on that room! 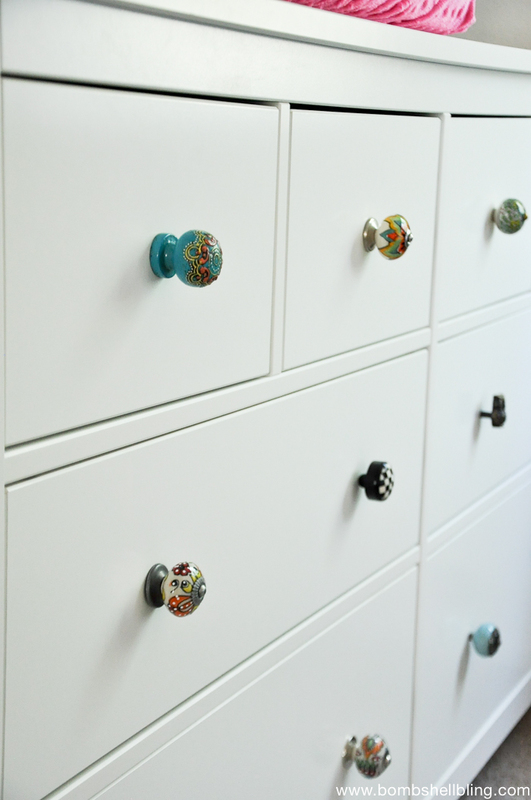 The knobs are from World Market.